As Autumn moves in at Parc Omega in Montebello, Outaouais in Quebec, Canada, the Autumn colored trees surround the wildlife which roam throughout the park. Atop of the rock ledge, beneath the Autumn trees, a coyote is barely noticeable as its fur blends in with the landscape of the park. Many have been confused when seeing a coyote as it is similar to that of a dog with the main differences being the pointed ears, long muzzle and the way their tail hangs when standing. 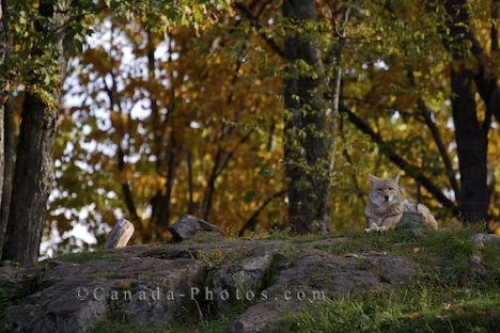 Coyotes usually travel in packs and hunt in pairs, but this coyote relaxing under the Autumn colored trees in Parc Omega, seems to be quite content while keeping a close eye on the humans watching him. There are approximately 19 recognized subspecies of the coyote which are found throughout Canada, Mexico, the United States and Central America. A coyote typically weighs between 15-46 pounds and can reach about 30-34 inches in length with an additional 12-16 inches when the tail is included. Picture of a coyote resting on the rock ledge surrounded by the beauty of the Autumn colored trees in Parc Omega, Quebec. Visiting Parc Omega, Quebec during the Autumn is one of the prettiest times of year, but one must keep their eyes peeled as the animals like the coyote, begin to blend in with the landscape. Coyotes, Canis latrans, at Parc Omega in Montebello, Outaouais, Quebec, Canada.